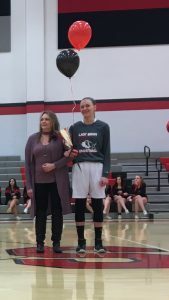 HYDE — The Clearfield Area High School girls basketball team celebrated Senior Night with a decisive 52-21 win over Curwensville in the Bison Gym Tuesday. Two of the three seniors had big games as the playoff-bound Lady Bison ended their regular season at 8-14. Brooke Cline scored a game-high 20 points and had four steals, while Nikki Brossard registered a double-double with 11 points and a whopping 21 rebounds. Junior playmaker Alayna Ryan turned in another strong all-around game with 16 point, eight assists and six steals. Defensively, the Lady Bison made it a long night for the Lady Tide with their match-up zone, forcing a majority of the visitors’ 31 turnovers either on outright steals or by taking away the passing lanes. In addition, they held the Lady Tide to 7-for-43 shooting. Curwensville first-year coach Bob Desmett agreed the large number of turnovers, many of them ill-advised passes, and poor shooting were a bad combination for his team, which was held to seven points or less in every quarter. “We played terrible. That’s the bottom line,” he said. “You just can’t do that against a good team. Curwensville’s junior standout did all she could, posting a big double-double by working hard for 18 points and pulling down 19 rebounds. However, Tarah Jacobson was the only other Lady Tide player to score. A pair of baseline jumpers and two fast-break layups by Cline got Clearfield off to an 8-1 start midway through the first period, and Curwensville never got any closer. Castagnolo was happy to give his four reserves playing time in the 12-3 first quarter. “They went in and did a commendable job,” he said. With nine points and 10 boards, Brossard almost had her double-double by halftime as the Lady Bison carried a 26-10 cushion into the break. The second half was almost a mirror image in the point department, Clearfield posting a 26-11 advantage. 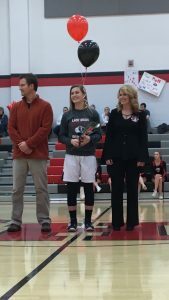 Karlie Gisewhite was the third Lady Bison senior recognized during a pre-game ceremony, and Castagnolo gave her a start in her final home game. The Lady Bison now turn their attention to the District 9 Class AAAA Playoffs and will have several practices to prepare for a probable semifinal at St. Marys, which won their Jan. 15 game 53-35. 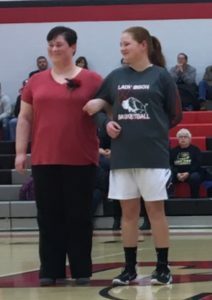 The Lady Tide (4-17) will end their season with an Allegheny Mountain League South Division game at Brockway Wednesday night. Clearfield’s junior varsity won the prelim 16-14. Jordan Witherite had 10 points for Curwensville. Sabrina Spencer 0 0-0 0, Madison Olson 0 0-0 0, Madi Weber 6 6-11 18, Tarah Jacobson 1 1-2 3, Brianna Swindell 0 0-0 0, Hannah Condon 0 0-0 0, Jordan Witherite 0 0-0 0, Emma Rebar 0 0-0 0, Brittney Wagner 0 0-0 0, Keisha Maines 0 0-0 0. TOTALS: 7 7-13 21. Tesa Miller 1 0-0 2, Alayna Ryan 7 0-1 16, Nikki Brossard 5 1-1 11, Brooke Cline 10 0-0 20, Karlie Gisewhite 0 0-0 0, Adrian Rowles 0 0-0 0, Megan Durandetta 1 0-0 3, Paige Rhine 0 0-0 0, McLain Alt 0 0-0 0. TOTALS: 24 1-2 52. Three-Point Field Goals — Clearfield 3 (Ryan 2, Durandetta). Officials — Markus Wolfe, Bill Wolfe and Al Price.